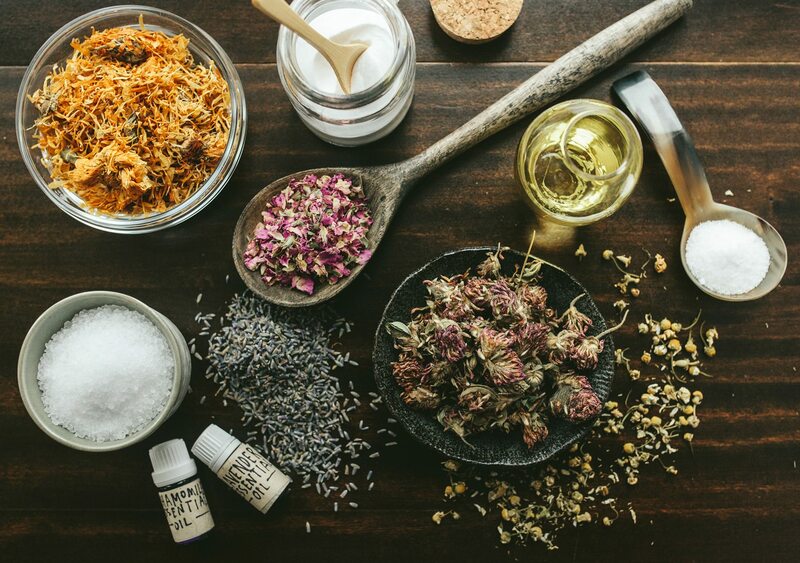 When building your herbal apothecary, many people do not consider adding classic beauty products like floral toners, infused oils, bath salts, or luxurious lotions–but beauty care is an integral part of healing. Just as tinctures and teas can promote healthy digestion and relaxation,* herbal self-care rituals encourage whole body wellness and nourish the spirit. For example, golden calendula flowers infused in oils can promote a radiant complexion and the simple addition of lavender essential oil to baths can relax the spirit. And while these spa-like practices and products may seem more indulgent than necessary on the surface, we believe in the wisdom of age-old rituals when it comes to wellness. Bathing is actually an ancient therapeutic practice called balneotherapy. Romans recognized the importance of water therapy and even provided public bath houses for citizens. Ayurvedic healers use steams, baths, and cold water plunges to maintain health based on your constitution–also known as doshas—and promote circulation. * Almost all ancient cultures prescribe therapeutic bathing rituals to promote overall wellness and calm the skin, our body’s largest organ. Herbs and oils have long been combined with bath therapy to relax the mind, soothe sore muscles, and promote supple skin. * These days, many bath products and cosmetics include harmful ingredients, like heavy metals and toxic carcinogens. Even worse, some commonly used products are also tested on animals. Verifying with The Environmental Working Group’s Skin Deep Guide to Cosmetics is a great way to ensure the quality of your favorite products, and we highly recommend checking labels to make sure they are made cruelty-free. While more and more companies are selling ethically made or sourced natural products, it’s often more satisfying to make products yourself. We’ve crafted two herbal bath recipes that are simple and soothing: our Spring Tea Bath Blend and our Flower-Powered Sea Salts. Start by blending the dry ingredients together in the large bowl, then slowly pour in the almond and essential oils while stirring. Add the mixture to the jars, and label them with their ingredients and the date crafted. Add a couple of tablespoons to each bath to enjoy a deep state of calm. Pour flowers into a mixing bowl and blend them together. Fill each muslin bag with the flower mixture or use cheese cloth and twine to create a small pouch. Tie shut and use one bag per bath. The bag can be tied to the water spout for the hot water to run through, or simply placed in the tub to float like a tea bag in an infusion. Whether you are drawing a bath infused with medicinal herbs or lathering on a natural and nourishing lotion, these healthy habits are fundamental to whole body wellness. In this busy era, it can often be hard to fully show up for ourselves and commit to these simple acts of self-love. When we weave herbs into wellness, these practices become even more enticing, like a sweet treat we want to indulge in again and again. Keep in mind that healthy skin and healthy bodies are also fueled by whole foods, proper hydration, and regular sleep. For more natural beauty care tips, check out Stephanie Tourles’s Organic Body Care Recipes or Rosemary Gladstar’s Herbs for Natural Beauty. Be sure to share tag us in your creations on Instagram—we can’t wait to see what herbal goodness you whip up!